At New Leaf Academy we offer a variety of extra-curricular activities for the girls to participate in. Our goal is for students to be challenged to learn something new, discover a new strength, develop new passions (or re-discover lost passions) and build self-confidence. Many of our students have stopped participating in most extra-curricular activities prior to enrolling at New Leaf Academy. These activities are also great ways for girls to work on their social skills, leadership skills and friendships while having fun. For a middle school and early high school girl, social interactions are her whole world. Developmentally, girls begin to define themselves through their social interactions during this period of their growth. For those girls who struggle to make friends and/or keep friends, there is a devastating delay in development as peers begin to mature and surpass the socially challenged girls in their interests and abilities to relate socially. Each New Leaf girl has the opportunity to earn her own bunny to care for. The girls learn about the importance and responsibility of caring for an animal and all that is entailed. Through our 4-H club, the Honey Bunnies, the girls learn leadership skills and participate in community service projects. They learn to demonstrate their skills and knowledge of rabbits by showing them at the Deschutes County Fair and local small animal events. And, of course, her bunny is a wonderful pet and emotional support animal. At New Leaf Academy, the student relationship with her bunny is a critical component in developing insight into subtle behavioral changes, trauma response and emotional regulation. We also work with Healing Reins to provide individual horseback riding lessons, horse vaulting and individualized equine therapy sessions when appropriate. New Leaf Academy plays soccer competitively against other middle school teams through our local Parks & Recreation department. All girls are a part of the team and our focus is on skill development, teamwork, communication and building self-confidence. 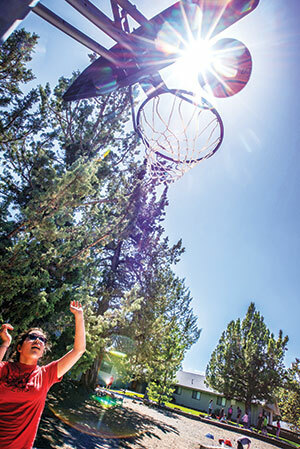 New Leaf students have many opportunities throughout the year to enjoy the beauty of outdoors in Central Oregon. New Leaf Academy is located at the base of the Cascade Mountains providing endless opportunities for outdoor recreation. We take the girls hiking, camping, white water rafting, fishing and swimming in the summer time. In the winter the girls enjoy skiing and snowboarding at nearby Mt. Bachelor ski resort, as well as snowshoeing, sledding and playing in the snow. These types of activities can typically challenge our students but also lead to increased self-confidence and self-esteem when they have participated in something they never thought they could. Each Fall and Spring, eight girls are selected to go on a week-long therapeutic backpacking trip. We partner with a local guide company, Wanderlust Tours to offer a 6 night/7 day back packing trip for our girls. This is a therapeutic trip led by members of our therapeutic team and a guide from Wanderlust. The girls experience the wonders of the natural world while they challenge their bodies and hearts. Every weekend we organize age appropriate activities that take place both on campus and off campus. In addition to the outdoor recreation and community service, we participate in a variety of activities such as roller skating, swimming, bowling, arts and crafts and outdoor games and team building exercises. Our off-campus activities allow the girls to spend time outside of NLA practicing their social skills while also enjoying “normal” teen activities, while our on-campus activities provide opportunities for learning friendships skills, team work and fun. Girls also will have the opportunity to earn an allowance by completing a daily chore, keeping their room clean, doing their laundry each week and earning additional “jobs”. If they earn a certain amount, they will have the opportunity to go to a store each week to spend their money or they may choose to save it in their New Leaf savings account. New Leaf partners with many organizations in town such as After School Buddies, The Environmental Center, The Family Kitchen and the Humane Society to teach the value of service and community involvement to the girls. While New Leaf Academy is not a religious school, we want to honor the spirituality of each student and family. We do take some girls to church services or Shabbat services on a regular basis. We are open to members of religious communities coming to campus to meet with specific girls if that is something that the student and family are interested in. We teach students to show respect to everyone and their different beliefs and provide education regarding different religions and holidays. we support families and children to reconnect, rediscover and heal.